Need help to Quit Smoking ? ---------------------------------------------------Sainsbury's have temporarily suspended their Phlebotomy services, due to staff shortages over the Christmas period. Extended GP Opening Hours, evenings and weekends. Extra appointments to see a GP or Nurse are available to all patients in Cambridge, Ely and the surrounding villages. You can book an appointment through your GP receptionist who will give you the time, date and venue for your appointment. or ask the receptionist in your GP Practice. Time is one of the most precious gifts we can share and it doesn’t cost a penny. How about sharing some of yours with the NHS? There are lots of opportunities to volunteer, from befriending patients on a ward, to being a first responder with an ambulance service, to being a hospital radio DJ. NHS at 70 is collecting stories from patients, workers, volunteers, and the public as part of a project, led by the University of Manchester, to preserve NHS heritage as part of the birthday celebrations. In addition, the Royal Mint has produced a special range of 10p coins which forms part of an A-Z of things that make Britain great – N is for NHS. Look out for these special coins and get involved on social media using #coinhunt. 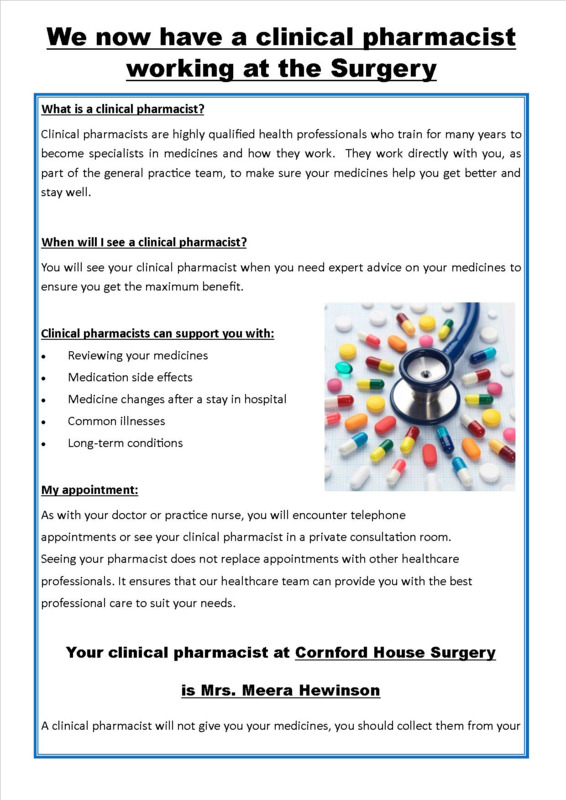 Will no longer be delivering or collecting Prescriptions from Cornford House Surgery or Fulbourn Health Centre. If you have elected to have your Prescriptions Electronically sent to TESCO that will remain unchanged. However, Controlled Drugs cannot be sent electronically, so will require patients to collect in person. at the Health Centre, Addenbrooke’s Hospital or other medical provision. Because we only had 7 drivers we were unable to help around 30 of those who contacted us. particularly because of the recent cuts in bus services. Passengers pay the driver 30p per mile on the day of travel. There is a minimum charge of £3 on all journeys, and drivers receive a further 15p, which is subsidised by the County Council. There is no long-term commitment and you will be supporting the elderly, the disabled and non-drivers in the village. For more information please contact the Co-ordinator on 07542 194 033. To send text (SMS) messages regarding appointments. To send information to other parties, such as: Insurance Companies, the Police or other Health providers (upon written request and authorisation). If you have visited the Surgery recently, you will have seen the notices asking you to complete a consent form. If not, then please take a moment to download this form and return it to the surgery, so that we may scan it onto your records as proof of your permissions. Please be aware that all your information is held securely and, is only accessed via security card and password. Do you agree to these consents? YES ……………. By signing this consent form, your rights under the new DPA and GDPR are not affected. You have the right to access any information we hold and the right to withdraw this consent should you feel your Privacy is compromised. The NHS prescription charge is to rise by 20 pence from £8.60 to £8.80 for each medicine or appliance dispensed from 1 April. The costs of prescription prepayment certificates (PPC) will remain frozen for another year to protect patients with the greatest healthcare needs, say the regulations outlining the increased charges which have been laid before Parliament. This means that the cost of the three-month PPC will remain at £29.10 and the cost of the annual PPC will stay at £104. Taken together, this means prescription charge income overall is expected to rise broadly in line with inflation. Charges for wigs and fabric supports will increase in line with inflation. The cost for a surgical bra will be £28.85, abdominal or spinal support £43.60, stock modacrylic wig £71.25, partial human hair wig £188.70 and a full bespoke human hair wig £275.95. The Keep Your Head website has dedicated areas providing information targeted at children and young people and at adults including older people. You don’t need to be a service user to access the site as the information is available to anyone who feels that they need some support with their mental health. The site has been developed by Cambridgeshire and Peterborough Clinical Commissioning Group, Cambridgeshire County Council, Peterborough City Council, Cambridgeshire and Peterborough NHS Foundation Trust, and the SUN Network. We cannot accept repeat prescriptions over the telephone. Year to date we have lost 662 appointments at Fulbourn Health Centre and 1554 at Cornford House Surgery, through patients not turning up or not cancelling their GP appointment. That is a total of 2216 appointments for the year, or 200 per month. If you consider that the average cost per appointment to the NHS is £45.00 this equates to £99,720.00 of wasted resources, or 200 patients per month that we COULD have seen. Late arrivals for appointments cannot expect to be seen the same day, although wherever possible we will always do our best to re-arrange an appointment for you. We are pleased to announce we have been awarded Accreditation as a Postgraduate Training Practice for the next five years, by the NHS School of General Practice. We are pleased to welcome Simba Kazhanje to the Practice as our Emergency Care Practitioner. Simba, who has many years experience in this role, as well as being a Paramedic will see patients from birth upwards who may not necessarily need a GP appointment. He can prescribe and refer, so if a patient is found to require further investigations he is able to refer them. This will free off more Doctors appointments for patients with more complex or long term illnesses. If you missed any of our Flu Clinics and are eligible for the Flu Vaccination or Shingles/Pneumococcal Vaccination then please book in with one of our Nursing team. Our recall procedure/process will pick up anyone who is eligible and not received a vaccination, so shortly you will receive a phone call or text from the Surgery inviting you to have your vaccination. Please click the above link for our CQC report, following an inspection on 11/8/2016. On the 5th July 2017, a Memorial Ceremony was held for Dr. R. Madabhushi. 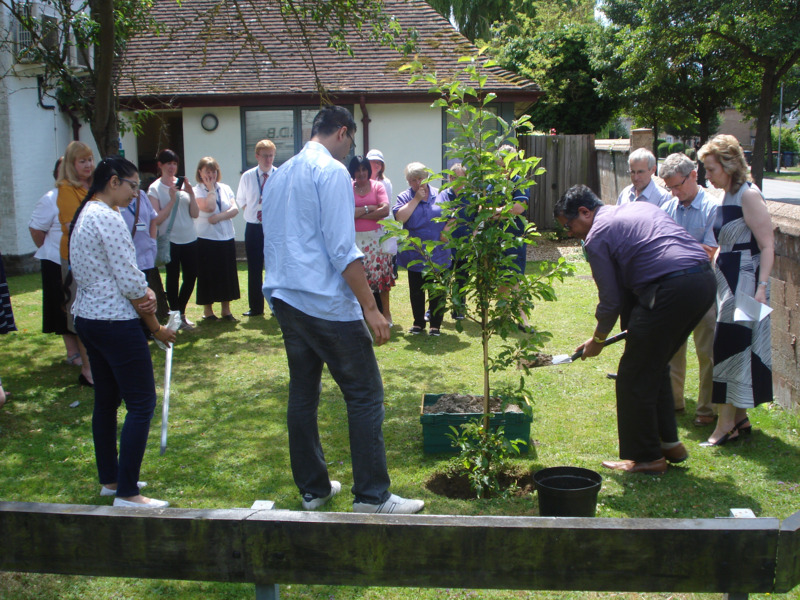 Partners, Colleagues and Staff were joined by Raji's family to plant a Crab Apple tree and place a plaque in her memory. It was a beautiful sunny day for an emotional, poignant ceremony to remember the care, inspiration and love Raji showed and instilled in us all. 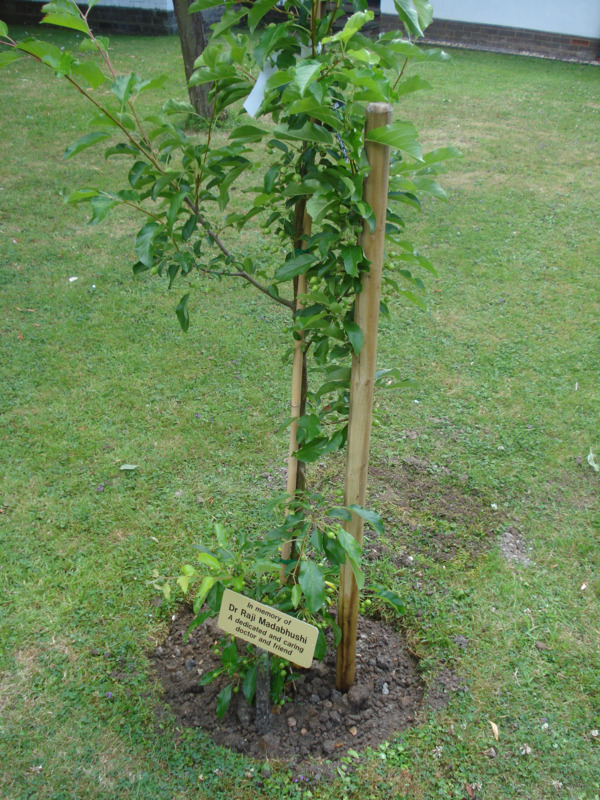 The tree is in the front garden of Cornford House, close to the junction with Wulfstan Way for all to admire and reflect on the huge contribution Raji made to the Practice and the care of her patients. She is and will continue to be missed, but the tree will serve as a fitting and flourishing reminder of a wonderful lady. We are pleased to welcome back Eva Marton, as a Specialist/Minor Illness Nurse. Eva brings with her a wealth of knowledge and experience. Doctors Ratnayake and Sharma join us at the begining of June and will spread their clinics over both sites. Both have been in General Practice for many years and will bring with them new insight and ideas. New App: Need to find local health services quickly? A new app to help Cambridgeshire and Peterborough residents find local NHS services is now available to download. Quick and easy to use, the 'MyHealth Cambridgeshire & Peterborough' app will direct you to your nearest appropriate NHS service. This includes local Gps' Pharmacies, Minor Injury Units and Dentists, based on your location or postcode. Free to download and available in five other languages including Polish, Latvian and Lithuanian, 'MyHealth' provides up to date information on current services including directions, opening hours and contact details. We know that around a third of our patients already take advantage of the convenience of being able to book appointments and order their repeat prescriptions online. We will shortly be arranging for those patients that want it to have the ability to view online, their own medical record held at this practice. It’s not that being able to see your records is new – you already have that right. Nor is it new that your records are kept electronically. Most GPs and health organisations keep medical records on a secure computer. Letters and other paperwork are coded or scanned and put into electronic format. This makes for far more accurate and speedy organisation of your healthcare. You won’t have to do any of this but if you need to use the NHS and social care a lot, it should make you feel more informed and therefore more in control. More importantly, it will make for a far more efficient and convenient service. After all, the information held in your health notes is about you and for you. *Consultation notes and letters will be available only from the date of consent onwards. Once you have given your consent, we will receive a message and your doctor will need to give their consent for your record to be viewed online. We as a practice are very keen to involve you in your care, be open and honest with you and give you as much information as is available about your health and your care and we hope that giving you access to your records online, should you want them, will make that easier. We do acknowledge however that this may not appeal to every patient and so the decision to gain access online is entirely yours in the first place. Should you decide that you would like this option then of course it will be especially important for you to retain control of your user name and password and to let us know at the earliest opportunity should you feel they may have been compromised so that we can regenerate a new password for you. 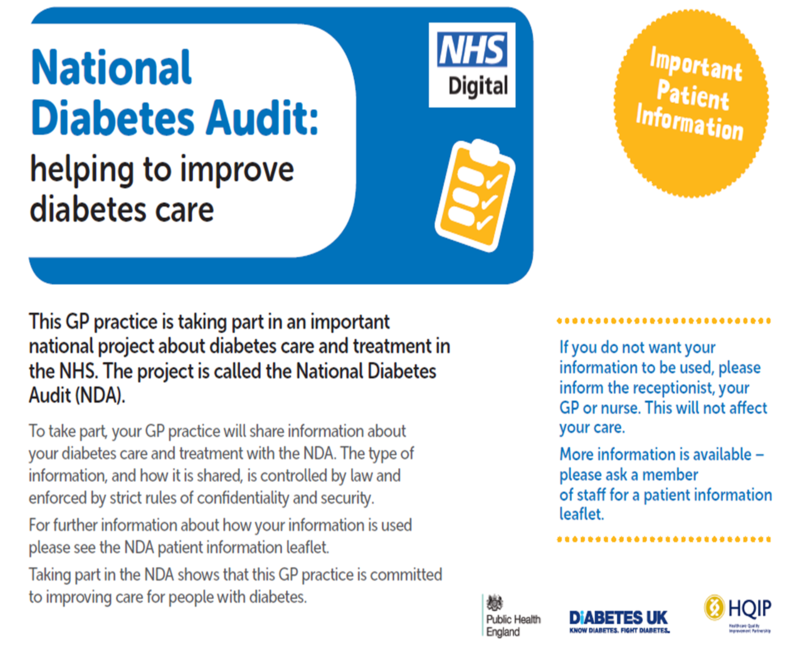 For those of you that would like to have access to your records, we hope you will find this a useful addition to the services that the practice offers.